Camp-California knows California! Let us help chart a course for your California camping or RVing adventure. California has it all – spectacular scenery, fabulous food, serious shopping and radical relaxation. And Camp-California has everything you need to do it all. Experience California by enjoying specific types of events such as “food festivals.” Participating in these festivals will take you to the far corners of the state and you’ll have a unique appreciation of California! Do you want to experience all of a particular type of attraction, such as California Missions, or lighthouses? Find information on specific activities such as shopping, hiking, fishing, kayaking … and more? Select “Discover California” in the top navigation. Choose the adventure you’re looking for in Places to Go. 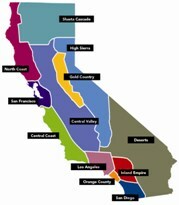 Or browse California by its regions and towns … View region descriptions. Once you’ve selected a region, use the Browse by Area link to read more about the major communities/areas in that region. Each region’s listing also includes attractions and annual events for that specific region. You’ll find info on various stops you’ll want to plan for as you create your own adventure in the region. As you can see, we know California … we’re building an extensive list of attractions, events and activities for you to use as you dream about your next California adventure!